Enjoy a 6 multiday tour through Leon, Oviedo, La Coruña, Santiago de Compostela, Vigo, Oporto and more from Madrid. 1st. Day (Tuesday) MADRID-LEON-OVIEDO (446 kms) Departure from our bus terminal at 8:00 a.m. towards Leon. Time at leisure to visit some of the most representatives buildings as the Gothic Cathedral with its beautiful stained glass windows, San Isidoro Church or the facade of San Marcos Hostal Plateresque style. Continue to Oviedo. Dinner and accommodations. 2nd. Day (Wednesday) OVIEDO-LA CORUÑA (295 kms) Breakfast. Departure to region of Galicia. Arrival to La Coruña. Short panoramic tour. In the afternoon optional tour to the Rías Altas through typical villages as Pontedeume, Betanzos, etc. Dinner and accommodations. 3rd. Day (Thursday) LA CORUÑASANTIAGO DE COMPOSTELA (75 kms) Breakfast. Departure to Santiago de Compostela. 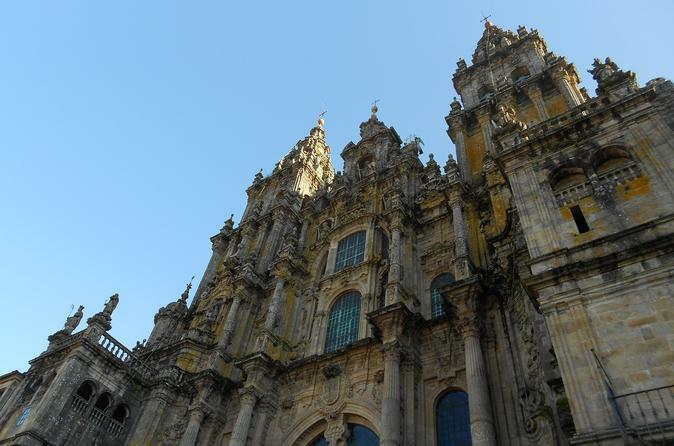 City tour of this legendary pilgrimage town, Plaza del Obradoiro, Cathedral, etc. Afternoon at leisure. Dinner and accommodations. 4th. Day (Friday) SANTIAGO-RIAS BAJAS-VIGO (90 kms) Breakfast and departure for the area of the Spanish Fjords (Rias Bajas), through splendid landscapes: La Toja Island, ría de Arosa and Pontevedra. Optional excursion to Santa Tecla and Valença do Miño across the Portuguese border. Continuation to Vigo. Dinner and accommodations. 5th. Day (Saturday) VIGO-VIANA DO CASTELOBRAGA-PORTO (220 kms) Breakfast. Crossing the Portuguese border we arrive to Viana do Castelo, city located between the mouth of the river Miño and Porto. Free time to visit the old town with cobbled streets and emblazoned buildings. We continue to Braga known as the city of the archbishops and the third most populated city in Portugal. Free time. Departure for Porto, considered as World Heritage city. Panoramic tour to admire the cathedral, Stock Exchange building, St. Clara church... we will finalize at a local winecellar to enjoy a tasting of the famous “Port wine”. Dinner at a local restaurant. Accommodations. 6th. Day (Sunday) PORTO-SALAMANCA-MADRID (566 kms) Breakfast. Departure to the border with Spain and arrival to Salamanca. Free time to walk through this monumental city and its famous Plaza Mayor. Continue to Madrid. Arrival and end of our services.